This study is from a picture I took while driving around downtown Ludington, not sure of the exact year but I know it was probably November. November is when you get the fiery sunsets reflected against heavy clouds rolling in over Lake Michigan. It’s awesome and dramatic, probably why I took the picture in the first place, although back then I wasn’t doing any painting at all. Just taking pictures for some nebulous future time when I’d have leisure to do something with them. Now I know that future time is the same as now time and if you’re going to do something, it’s best to do it now. 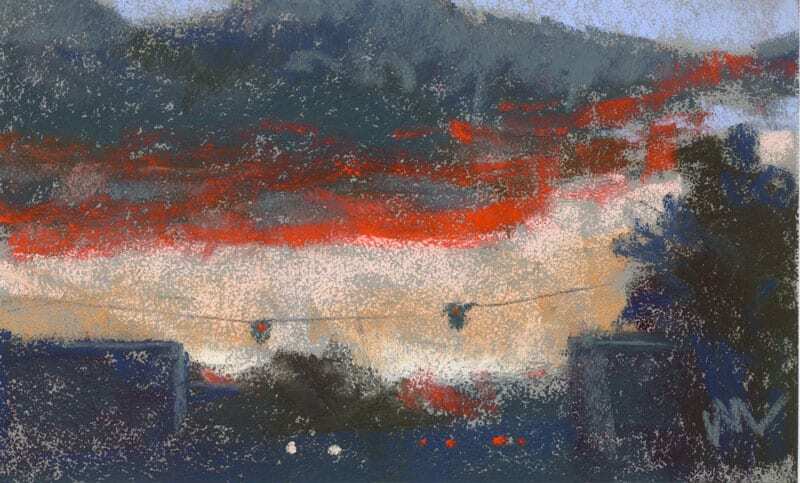 Sunset Downtown, 5×8″ pastel on mi teintes Touch paper by Marie Marfia. $75, unframed. Contact me to purchase. This entry was posted in A pastel a day, painting a day, Pastels, Skies and tagged daily painting, downtown, intersection, moody, painting, pastel, sky, sunset on June 24, 2016 by Marie Marfia.